Tomatoes are grown and consumed all over the world since they offer a myriad of health benefits, and a distinctive, tasty flavor. These powerful anti-inflammatory foods are the second most produced and consumed vegetable nationwide and are abundant in lycopene, beta-carotene, folate, potassium, vitamin C, flavonoids, and vitamin E.
Tomato nutrition has a lot to offer, but gardeners actually raise them mainly for one reason, and if you have ever tried a tomato straight from the garden, you know the difference. The ripe-on-the-vine freshness these tomatoes offer cannot be obtained from store-bought versions. There are easily preserved through canning and freezing, so you can grow a bumper crop to enjoy them even throughout the winter months. Indeterminate varieties, which can grow up to 12 feet in height, since they keep growing until they are killed by frost. Plant the tomato seedlings in pots, and poke holes underneath to prevent water stagnation. In order to make them flourish and ripen, you should ensure they receive at least 8 hours of direct sunlight daily. Moreover, water the tomato seedlings twice a day, in the morning and in the evening. They are ready to graduate to soil beds after about a month. Dig large holes to accommodate the seedling and its additives, of about 20-24 inches (50-60cm). It would be best if they are spaced out by at least three feet (0.9m). Fish heads are rich in nitrogen, which is released as they decompose. A lack of nitrogen is the cause for the unhealthy look of the tomatoes, so make sure you satisfy them with organic nitrogen sources, like fish heads, fishtails, fish guts, fish waste, and all kinds of seafood waste. Place the fish head into the hole, with the open end in contact with the soil. You should also drop a few aspirin tablets in the hole as well, as the acetylsalicylic acid triggers a defense mechanism in the plant, known as the Systemic Acquired Resistance Response. In this way, the tomato will fight off antigens like bacteria, fungi, and viruses. Willow water is another natural source of salicylic acid, and it is made from the bark of the willow tree. Cut the fresh bark into 1-inch strips, place them in a jar, and pour hot water over them. After a few days, the color will be completely stripped from the bark, and you can store your willow water in the refrigerator. Before planting, you should soak the cutting in the willow water for 24 hours. Low calcium levels lead to blossom end rot, a common disease that affects tomatoes, squash, peppers, and eggplant. Therefore, crush 3-4 eggshells, and pour them into the hole, to provide enough calcium and protect the blossom ends. 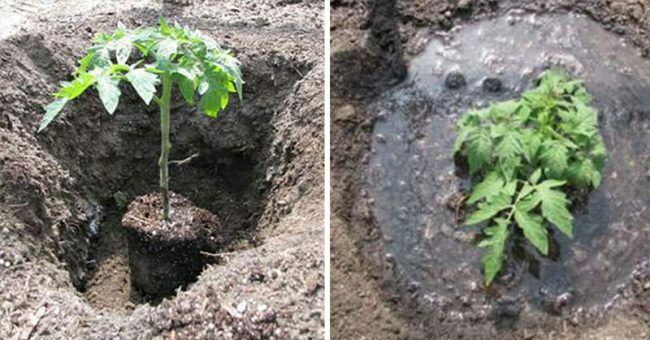 A phosphorus deficiency might be the reason why your tomato plants grow slowly. A bone meal from any animal is a rich source of it. Therefore, scoop a handful into the hole. In the end, add 2 spoonfuls of an organic NPK fertilizer, high in nitrogen, phosphorus and potassium nutrients, in a 4-6-3 ratio. Then, trim the lower leaves on the stem, and cover the hole with the first layer of soil. Then, add the seedling, but make sure the leaves are above the soil level. Spray the plant with a mycorrhizal fungi product before you extract it from the pot, to prevent diseases and boost the absorption of water and absorption. Place the plant into the hole, fill with soil, and gently push. Make a small well around the base of its stem before the first watering, in order to help it preserve the water longer. Water the tomatoes several times on the first day. Make sure your tomatoes get the needed sunlight in order to thrive. Apply compost or fertilizer twice a month, and remove any weed where necessary. And then, just enjoy your fresh and delicious tomatoes from your own garden!